What Does File Contention Look Like? Every now and then someone calls in and complains about terrible performance. Often times, the tech handling the call will try to recover performance by killing CPU intensive processes or closing unused applications1, especially those with large memory footprints2. More often than not, though, the issue can be described as file contention, a condition where performance is “penalized” because the disk cannot keep up with file IO demand. Sometimes a BSOD is not a sign of a software issue but instead points to a hardware problem and might help explain the symptoms of bad system performance. That was the case recently when a user complained that she was having troubles trying to logon. The workstation was amazingly slow (can slow be amazing?) and then blue-screened on her randomly. My co-worker was handling this but he happens to sit right next to me and I jumped in when I heard the words “blue screen”. I unkindly interjected with “Lets get a minidump.” While he chatted her up, I went about getting her IP, connected via the UNC, went into C:\Windows\Minidump and grabbed the last two mini dumps for that day. Minidumps excite me. To understand why, you need to have come across a great amount of support calls that usually end up trumping first tier technical support. Often times, these issues are too vague to narrow down if you don’t know how to handle a BSOD, and the incident remains open longer than it needs because it can’t be explained or reproduced immediately. The mini dump provides a means to sometimes quickly resolve what might otherwise become an unexplained system problem. This is rather mundane, but an issue that another technician was unable to resolve required my assistance. The problem was that at random times while the user was typing in any Office application, the Save As dialog box would suddenly open. We also established that he was not using any special keyboard, such as the ones that turn various common commands into a single button or key-stroke paradise or 3rd party kb management software. Nope, just a plain-jane standard usb kb. Working remote and with nothing to go on, I decide to open Process Monitor. Actually, I asked the user to compose a message while I watched. He was a fast typist but I soon noticed a trend, the Save As would open when he was correcting a typo using the backspace key. The question then became how do you invoke the Save As dialog box from keyboard? F12. 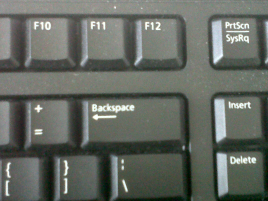 Backspace happens to be right under F12 on most standard keyboards. The proximity of the Backspace key to the F12 was probably causing some debris or other electrical quirkiness against the F12 key, too, making it act as if it was being depressed each time Backspace was. The solution, in case you haven’t caught on by now, was to replace keyboard. Not all my encounters are this exciting. In a large organization, this can actually be quite common. Many a floor support tech has been dispatched to try to correct by physically checking or replacing the drive. The symptom is that the CD\DVD drive letter is missing in Windows. In the vast majority of cases, this is a software issue and can be resolved remotely, without the need for someone to open the system. The cause is the result of class filters becoming corrupted or modified in some way, usually because of a badly written or incompatible driver, firmware update, or after installing CD\DVD burning software. To see missing drivers for any hardware component just open the System Information utility from Start > Run and type msinfo32. You can also do this remotely with any computer within your network by using the View > Remote Computer option.